Your prospects likely have dozens of sellers seeking to connect and build relationships with them. 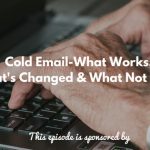 That means dozens of cold calls, emails, and presentations by dozens of different organizations. 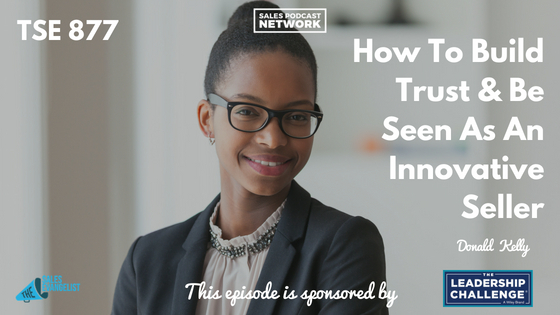 The key to success with any prospect is to build trust and be seen as an innovative seller. 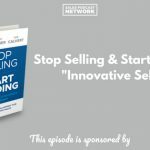 Today on The Sales Evangelist, we begin a 3-part series based on the book, Stop Selling & Start Leading: How to Make Extraordinary Sales Happen. We’ll discuss principles that sales professionals need to adopt and apply in order to be successful. Imagine yourself in a meeting with a prospect for a deal that could be the biggest of your career. The prospect continually interrupts you and you’re frustrated because none of your best content seems to be making a difference. In a moment of frustration, you tell her you’re only here because she invited you. You could be home hanging out with your family and your pet rabbit. Something changes immediately. It turns out the prospect has a pet rabbit, too, and suddenly you have something in common. You two launch into an entire conversation about lives outside of work and a relationship begins. This is one of the stories in the book Stop Selling & Start Leading: How to Make Extraordinary Sales Happen, and it illustrates how commonalities can boost you from seller to trusted advisor. Let the prospect know who you are. Let her see behind your sales persona to your other interests. Find a way to remind her that you’re human. Building rapport encourages the prospect to share something of her own with you, and it may give the buyer reason to connect with you. Illustrate to your prospects that you’re an innovative seller. You must know the roles and challenges of the industry you’re selling to in order to provide solutions that make your prospect’s life easier. If you’re working with CFOs in manufacturing, what are the challenges they face on a daily basis? Trade wars with China? Looming high prices? If I can provide intel or info, even if it’s unrelated to my product, I can help the prospect prepare for — and deal with — the challenges that are stumping her. Will the company face layoffs? What if they have to raise prices? When a small organization hires a new seller, they begin a honeymoon phase in which everyone is excited. Eventually, though, the seller gets bored because he doesn’t have any training processes. The CEO doesn’t have time to invest in him because he’s busy running the company, and the seller gets tired of doing cold calls. I’ve seen it happen countless times, and I can see around the corner for small organizations because I’ve seen this happen before. I can point out five things they’ll struggle with long before the issues actually arise. If you present yourself as a trusted advisor, your prospect will trust you in all things, and she’ll look to you for solutions. We’ve been recommending the book the book, Stop Selling & Start Leading: How to Make Extraordinary Sales Happen from our sponsors at Wiley for quite some time because we believe in the message. Based upon interviews with buyers, it offers specific information for sellers to help them become trusted advisors. As part of the series this week, we have a SlideShare available for you to download, or you can link to it here. As always, we also have a free excerpt of the book so you can try it out for yourself. We believe you’ll like it so much you’ll want to grab your own copy. Today’s episode was also brought to you by Video Jungle podcast, your source for marketing and making your brand pop using video. Plan, create and share your way to better content and strategy.